I Buy Way Too Many Records Dot Com: Patsy's Rats - Rock N' Roll Friend 7"
Another La-Ti-Da single and another band that's new to me. 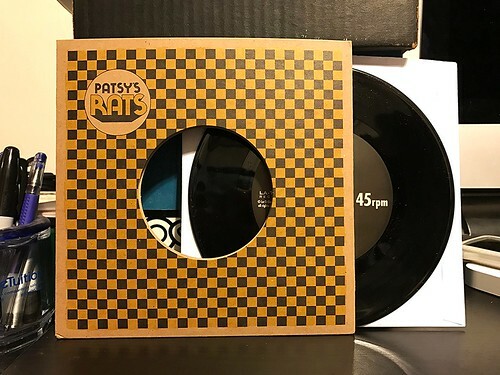 Patsy's Rats hail from Portland, OR and have crammed two songs worth of poppy, catchy rock and roll into this 7". Led by singer Patsy Gelb, the band combines 70's power pop guitar noise and instantly hummable vocal melodies. The A side is the highlight for me (which it should be, that's the whole point of an A side, right?). "Rock N Roll Friend" is fast paced and bouncy, juggling upbeat guitar riffs and a thumping rhythm section. Things slow down slightly with "Hard Time Karen." Though just because the tempo is a bit more low key, it doesn't really make the song any less formidable than its companion on side A. It's another tremendously catchy song with a big hooky chorus. All in all a very enjoyable 7" and one that I'm not sure that I would have ever heard if I hadn't picked up the big pack of records that La-Ti-Da offered as a bulk purchase. It may not have been a singles club in the traditional way, but it still achieved the same goal, getting me a bunch of new bands to listen to. That's something I can always get behind.